Every now and again, an artist comes along that blows you away, in every facet. Dan Bremnes is one such artist, with his label debut full length album Where The Light Is releasing via Sparrow Records this past week- this album is one of my favourites of 2015! Hailing from British Colombia, Canada; Dan’s contagious vocal melodies and inspiring and encouraging acoustic style songs have been enjoyed by listeners for many years, as he has won numerous GMA Covenant Awards and has been praised and celebrated all throughout his home country. I had stumbled across Dan’s music a number of years ago on his independent album Your Strength in 2010 and since then I only have good things to say about the singer/songwriter, who has recorded a stellar batch of 11 songs worthy of many listens, reminding us that Jesus is where the light is and that Jesus is with us always in all of our circumstances and situations. With a similar vocal to independent artist Jadon Lavik and Starfield frontman Tim Neufield, Dan has given us a glimpse into his thoughts and viewpoints on restoration and life as we soak in the Holy Spirit anointed lyrics and creative musical backdrops for each of the tracks. Where The Light Is is a great purchase for anyone who loves a fusion of worship and acoustic pop, even though we may have heard 5 out of the 11 songs already! As Dan peels back the layers of himself and we are glimpsed into his most vulnerable moments; our enjoyability of each melody, particularly the ones we have heard before, heighten to new levels. The guitar led and mid-tempo ballad “Where The Light Is”- the first single- is semi-autobiographical, as Dan eloquently and passionately sings about the early days when he was a Christian, but also contrasting that to the tragedy he experienced when his mother passed away due to a car accident. As Dan struggled with his faith, the chorus in this song more than adequately describes his tumultuous feelings and upside down emotions. Dan cries out to God ‘…God be with me, don’t know where I’m going, will You lead me where the light is?…’, offering up transparent lyrics that do not shy away from the meaty topics, yet also providing us with a glimmer of hope near the end of the song, as Dan sings out that Jesus is our daylight and we should and can run to Him so that He can provide us with healing and comfort. The folk/pop/worship banjo infused energetic and celebratory melody “Hearts On Fire” is another album highlight, led by intentional and impacting percussion and chorus gang vocals, bringing the song to life as Dan majestically sings praises to God, asking Him to ‘…light me up, light me up, set my heart on fire, let my life be a song like an angel choir, may my worship be endless, untameably reckless for You, only You…’, reminding me of bands like Rend Collective and I Am They in their delivery, kudos to Dan for including this inspiring and musically different track! The mid-tempo label debut radio single “Beautiful” was recorded way back in 2010 (a different version!) for his independent album, and again for Sparrow Records in July last year. Including the very first single on this album is fitting, as we are given perspective through the testimony-like track, as it highlights Dan’s earnest and honest heart for Christ. As Dan ardently sings out amongst the pulsating drums and dynamic guitar strums, that ‘…You changed me from what I used to be opened my eyes, now I can see, You’re making this life so beautiful…’, I’m amazed at the high calibre of songwriting- Dan deserves praise and recognition for such vulnerable lyrics that only describe a fraction of who God is to us. Out of the 5 melodies I have listened to before, the only blip is the piano prominent mid-tempo ballad “He Knows” (with the same theme of Jeremy Camp’s song of the same name), where the passion is somewhat lacking when compared to the rest of the thought provoking and comforting melodies. In its own right though, the song is nonetheless inspiring, with the chorus being powerful as Dan reminds us that ‘…He knows every pain every tear you’ve cried , every single part of you, He knows every doubt, every fear that you fight, the battles you’ve been going through…’. The final melody present here, which was present on the EP as well, is the acoustic guitar led celebratory raucous “Born Again”, driven by an infectious and catchy acoustic guitar riff and stomps galore, as Dan fervently invites us all to sing along that we have been set free and born again. One of the more musically dynamic melodies on this album, this track will sound awesome live as the crowd reacts positively and dances along! The rest of the 6 songs are also quite magical and poignant. “In His Hands” is driven by light acoustic guitar, as Dan emphatically and fervently conveys that everything in this world, inclusive of ourselves and our problems and circumstances, are held by God. Reminding us that we can trust God in any situation, even when everything around us is crashing God, as Dan cries out ‘…so many things I don’t understand, but He is God, He knows all of them, He’s got the whole world in His hands, He’s got the whole world in His hands, He is reaching out, let us run to Him…’, we are inspired to lean in and press into God more so that we can fully rely on Him, even in the midst of pain and suffering. While the pop radio friendly potential single “Wide Open”, led by stirring electric guitar and captivating acoustic guitar, has Dan ardently and emotionally admitting his need for God, and outlining that He needs God to restore his whole being and provide Him with a sense of belonging, and also needs God to speak to him so that he can further his relationship with God; Dan continues to be vulnerable and showing the deepest parts of his soul, especially in the 3 minute pop tune “Faith Is”, where Dan vividly provides an account of what faith is, describing that ‘…it doesn’t hesitate to step out on the waves head first, reckless, that’s what faith is…’. Though musically Dan doesn’t cover much new ground compared to his CCM contemporaries, lyrically there’s gold in these songs, which is what I am finding even in the third or fourth time listening to this album! The acoustic nature of the comforting and inspiring “Over” complements the insightful lyrics, as Dan continues the enjoyable melodies and highlights the fact that our sins are washed away,, and that we are a new creation in Christ, as ‘…it’s over, yesterdays are washed away…so go ahead and turn the page, you can leave the past where it’s at, the cross has covered that…’; and Dan brings the tempo back up in the hand clapping, guitar strumming, jovial celebratory mid-tempo melody danceable number “I Am Sure”, reaffirming that ‘…no matter what this life may bring, Your love will not let go, I am sure…’, that God loves us immensely, and will never let us go. The album ender “At Your Feet (Surrender)”, a reflective piano and acoustic guitar led emotional and honest ballad, touches upon the theme and the heart of the album, that being in relationship with Jesus is the best thing that will happen in our lives, as we dive in deep and worship Him at His feet, giving everything to God as everything we have right now is from Him anyway. Well done Dan for a thoroughly enjoyable, honest, vulnerable, heartfelt and encouraging batch of songs- a batch I will listen to more and more as the year progresses. 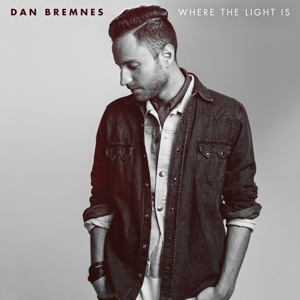 Dan Bremnes’s brand new label debut album Where The Light Is is a great gem and treasure for those who love acoustic pop or adult contemporary music similar to artists like Brandon Heath, Matthew West or Josh Wilson. Dan’s acoustic musical element is a fantastic element to hear and it’s a blessing to listeners that he was signed to Sparrow Records. Incorporating many themes on such a dynamic and musically unique album, so as listeners understand his faith journey and how he became a songwriter, Where The Light Is inspires and provides us hope in our Father and Saviour as He is our light and the One we can lean on and trust. Well done Dan for these eleven songs of wisdom, clarity and timely restoration, with the title track, “Beautiful”, “Faith Is”, and “At Your Feet” being my personal favourites. I hope and pray that the album will touch lives just like the EP accomplished! Previous PostNorth Point Inside Out – HEARNext PostWOW HITS 2016: WHAT’S YOUR PREDICTION (PART 2)? Dan’s full length album can be streamed in full, on CCM Magazine for a limited time, check it out!